Two steps back. That’s how a journey often works, huh? At least in my experience that’s how the Willis Tribe rolls. We’re operating at a 50% happiness level right now. Chris is loving his new gig. He’s relishing the opportunity to pontificate, to think of intriguing questions and then to find the answers. He’s in his element. Sam has made a big splash at Starkville High School. He’s being interviewed for the school paper on Monday. Today, he had a quick photography session in our backyard with the uber-talented Bailey. He’s starting a lacrosse program here — has hooked up with MSU’s defensive coach, is soliciting a great deal of high school interest. He’s a man on a mission… and the talk of the town. And Gus? Well, we know all about 2.0. The rest of us are struggling a bit. Sometimes more than a bit. George is flummoxed by the culture change at his elementary school. He can’t quite wrap his brain around how he fits into the big picture here. Mary Claire left school crying on both Thursday and Friday. She misses her girls something fierce. I understand. More than completely. We cried together for awhile, wallowed in our shared misery. I just want to walk down my adult hallways and see my friends, too. I miss them so much. I hate the neediness that comes with being so far away. And yet, it continues to rear its ugly head. Have they forgotten me? Do they think about me? Will the miles eventually prove to be too much? At home, their lives have continued on. Their day-to-day hasn’t changed. They have routines, families, other friends to fill any void that we might have left. Here, everything is different. I have far too much time to miss them, to pine for them, to wonder what they’re doing, to fear losing them. On my good days, I can put on my big girl pants and march fiercely into my new life. On my bad days, I can’t even get my feet squarely on the ground. When I hold my sad kids and wipe away their tears, I know I need to listen to the lessons I’m teaching them. “Life morphs and changes and moves. Nothing stays the same. We get to see new things, make new experiences, meet new people. We get to stretch and grow and prosper. We get to be better than we were before by doing something we’ve never done.” I believe all those things. Sustaining that belief in the face of so many tears is what challenges me most. It’s the marathon, not the sprint. And I’m on mile 18 right now. I remember that stretch vividly. Past the Indiana Museum of Art, into the unknown expanse of mile 19, then 20. Some of the longest miles of my life. I had to dig deeply to get through those particular stretches of road, had to ignore the pain, the blisters, the fatigue, the self-defeating “I’m not sure I can do this” thoughts. I forced myself to smile during those miles, turned up my iPod a little louder, high-fived the marathon volunteers as I shuffled by. And then 20 turned into 21… and 22… and 23… and 24. Slowly, and with great determination, the end was within reach. And at the end? My friends, my family were there to run me across the finish line. I was exhausted, I was emotional, I was spent. 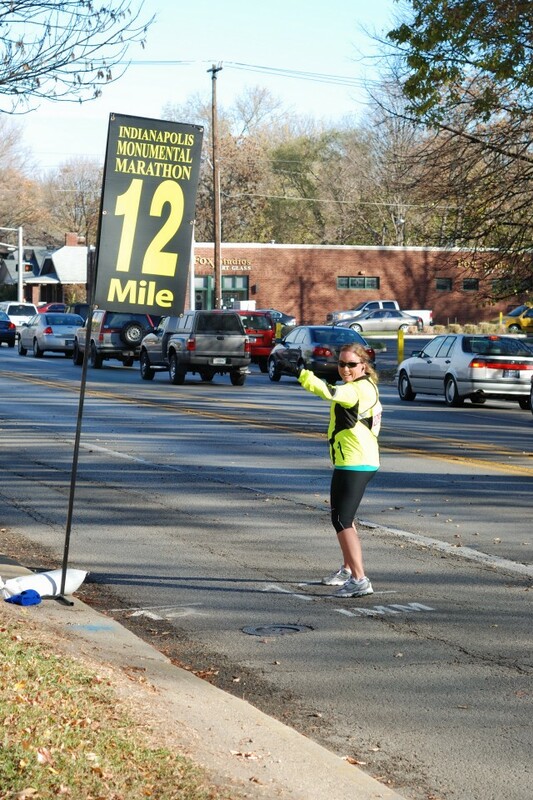 I cried as they cheered for me, dragged my weary body across the 26.2 mile mark. Realized that when I felt most alone on my journey, they were still there, still supporting me, still cheering for me, still sending me messages of encouragement, still thinking of me. We will make it now. This entry was posted in Help From My Friends, Me Myself And I, My Kids, We Are Family and tagged change, family, marathon, moving, new friends, old friends, sprint, Starkville, stretching. Bookmark the permalink.